पीएम मोदी लोकसभा चुनाव के लिए लगातार सभाएं कर रहे हैं. New Delhi: Hours after Priyanka Gandhi’s appointment as AICC general secretary for Eastern Uttar Pradesh, Prime Minister Narendra Modi on Wednesday made a veiled attack on the Congress, saying that “in most of the cases family is the party but for us, BJP is family”. Interacting with BJP’s booth-level workers in Maharashtra, PM Modi said: “In our party, decisions are not taken on the basis of what a person or a family wants, and this is why it is being said that in most cases family is the party itself, but for the BJP, party is family”. Gandhi family scion Priyanka Gandhi Vadra formally entered politics on Wednesday with the Congress appointing her general secretary for Uttar Pradesh East, ending years of speculation and signalling the party’s intent to go full throttle in the state ahead of the general elections. Priyanka Gandhi, 47, will take over her new assignment in the politically crucial state — a Congress bastion till the mid 1980s — from the first week of February, a statement from the party said. She will assist her brother, Congress president Rahul Gandhi, in the Hindi heartland state, which has 80 Lok Sabha seats, the largest of any state in the country. The appointment is being seen as a masterstroke, which will infuse energy in party workers of a state where Congress influence has been waning over the years and where the Samajwadi Party and the Bahujan Samaj Party have announced a tie-up. 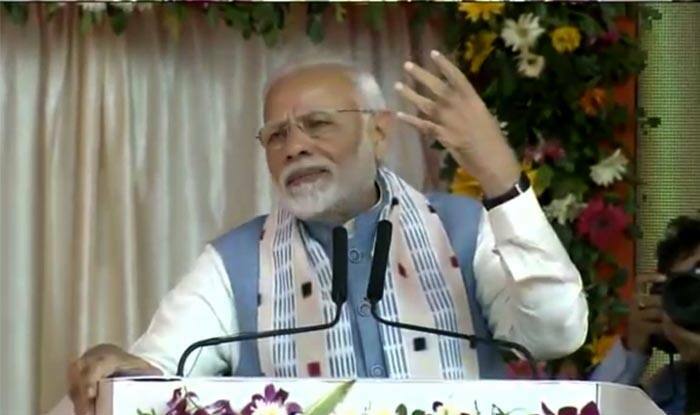 Furthering his attack on the opposition over the government’s decision to provide 10 per cent decision to economically weaker section in the general category, PM Modi said that those who supported the amendment bill “half-heartedly” and now approaching the court against it. “People who were forced to vote half-heartedly in favour of reservation to economically weaker section in general category, are now approaching courts. They never showed interest in taking positive initiatives themselves,” said PM Modi. “I want to make it clear there won’t be any effect on the reservation already provided to different categories. Now the poor children from General Category will also be able to get into IIMs and IITs,” he added. The constitutional amendment to provide the 10 per cent quota was approved by Parliament earlier this month and had received assent of President Ram Nath Kovind last week.